Few know just who the ‘house of Israel” is in the modern world. Then again few know that after Solomon Israel split into the northern 10 tribes of the ;house of Israel” while Judah, and a smattering of Levites, with some of the tribe Benjamin and a few from other tribes, formed the southern “House of Judah”. Few then realise that prophetic scriptures concerning “Israel” or the House of Israel are not directed at the Jews. But if not the modern day Jews, then who? 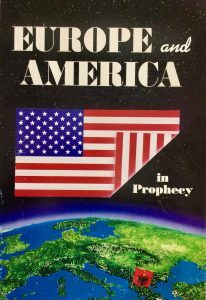 You can find that out from our free book offer “Europe and America in Prophecy” by Garner Ted Armstrong. Listen to this outstanding Stan Roberts sermon and you will also receive an excellent lesson as to who the term “Israel” pertains today. The Jews, Judah, have their own prophecies levied against them.